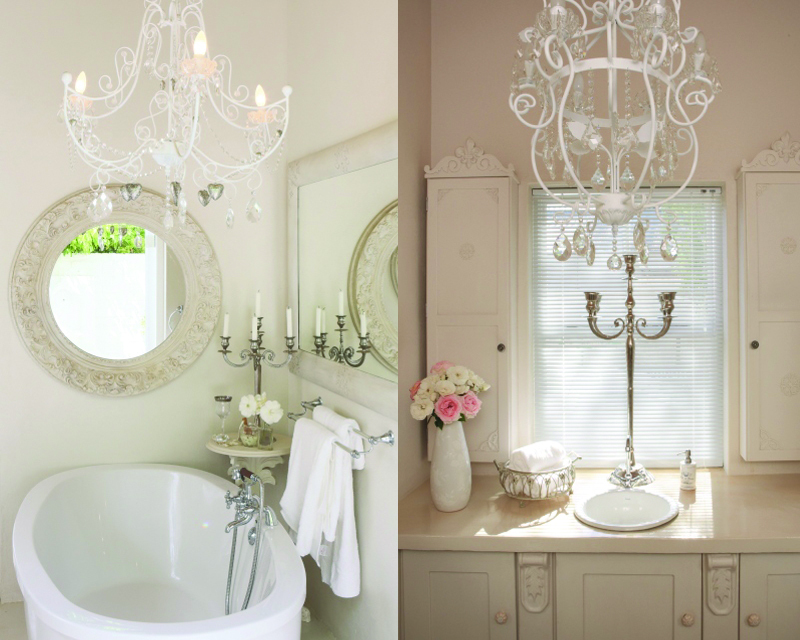 Here's how to make your interior a charming sight that exudes comfort and serenity. 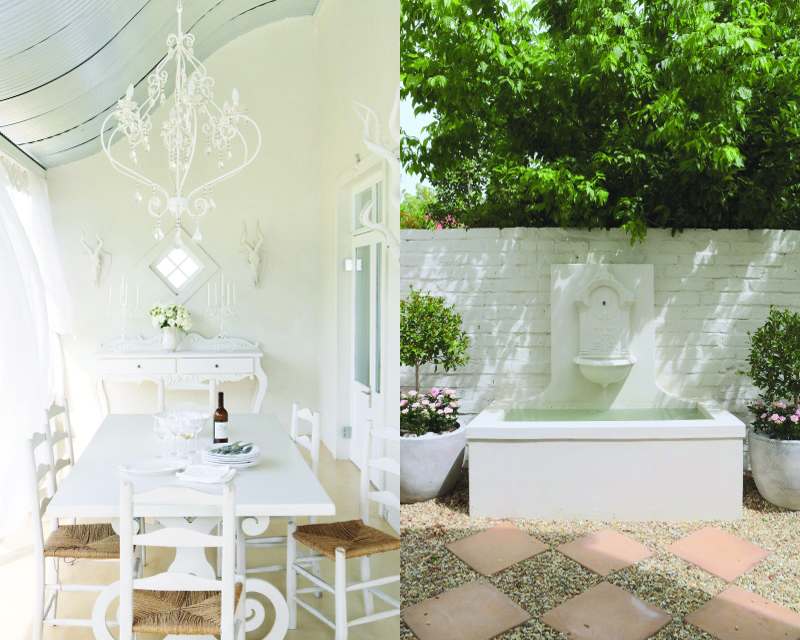 Anneke Blaise, a creative soul with a passion for all things white shows us how totally relaxing and utterly romantic his signature aesthetic can be. Neatly tucked away in the enchanting town of Montagu, it’s hard to believe that artist and furniture designer Clive Biden’s 164m2 home is a brand new building. "I wanted the house to be part of its surrounds and to me, it achieves this beautifully," he says. The biggest thrill was seeing how the rectangular structure took shape, early in 2011. It all started with a steel frame construction that went up in less than three days, a flat roof and 4m-high walls that give the relatively small house the illusion of being far greater in size. Clive managed the building and interior project from start to finish, selecting, designing and even – in many cases – making things himself! 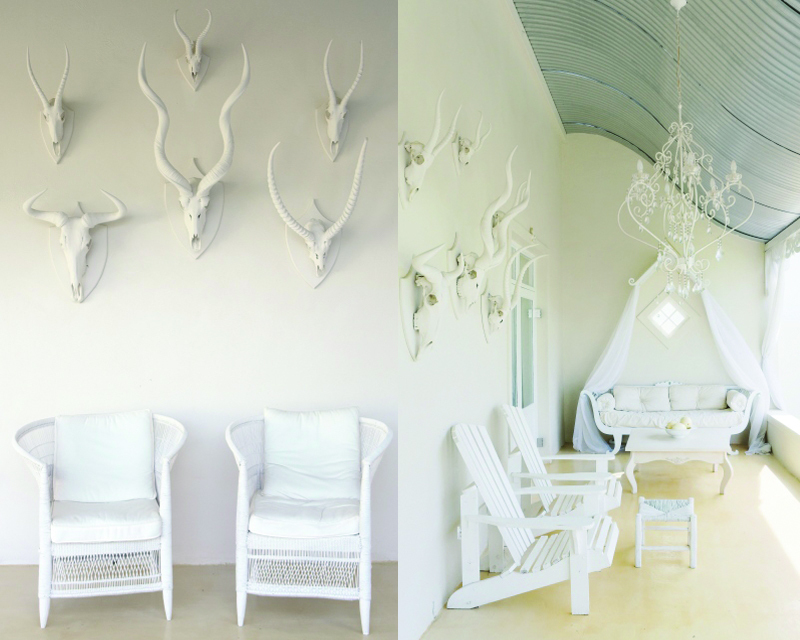 The Karoo-style stoep with its curved, corrugated iron roof greets guests with a sense of light and warmth, thanks to textural contrasts: sheer curtains that keep the heat at bay, animal horns painted white, linear Adirondack chairs and a curved, French-style canopied bench, all depicting the casual elegance that extends throughout the house. Clive designed and made most of the furniture and accessories. The inspiration for the design and interior of the house took shape while in Paris, France, explains Clive. 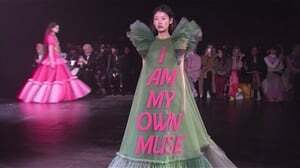 "The pieces of the puzzle fell together after I’d been granted an artist’s residency at the prestigious Cité Internationale des Arts in the heart of Paris, overlooking the Seine and Notre Dame. I was taken by the architecture. "Though I was surrounded by museums and art galleries, for me the great art of Paris lay in the buildings and I realised that instead of painting canvasses, I wanted to create functional art – such as bespoke furniture pieces with a French twist." Well-travelled furniture pieces such as the Malawian chair mix easily with local finds and Clive’s handiwork, all fitting neatly into their demarcated areas of the room and made even more impressive by the high ceilings. 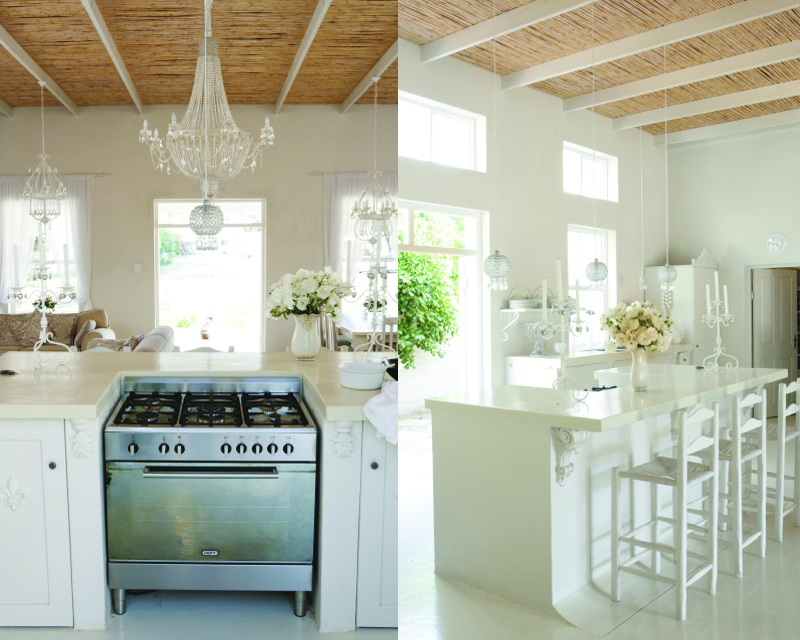 Built in a typical Karoo style with high ceilings of curved corrugated iron outdoors and reeds indoors, concrete floors and an 18m-long, 3m-wide stoep, it is the open plan living and kitchen areas – flanked by the two guest bedrooms on the left and the main bedroom with ensuite on the right – that undoubtedly set the tone for the whole house. The overall white colour scheme was a given. "Since I can remember, I’ve been a fan of white. It reflects my personality – it’s relaxing, pleasing on the eye and makes me feel good. It’s a blank canvas and it looks completely different from morning to night, as the light changes." Even this guest bedroom (right), which has doors opening onto the veranda, bears the hallmarks of Clive’s handiwork in the floorstanding mirror, chandelier and headboard. 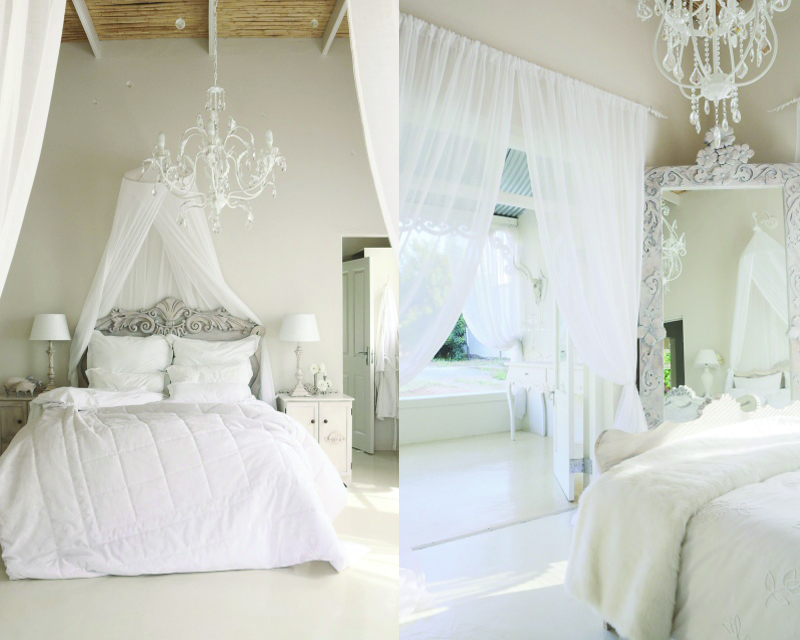 Pristine white bed linen and sheer fabric drapes impart serenity and romance. Clive’s flair for decorating on a shoestring has inspired the soulful atmosphere of his home. He uses unusual furniture pieces and accessories that he either up-cycles or makes from scratch; the reeds used in the ceiling come from a neighbouring farm and the lived-in feel is created with the clever use of textures in pieces as varied as painted horns, ornate wooden mirror frames, Nguni hide rugs and the fireplace bricks, all offsetting the largely white space. Like the celebrated 20th century architect Mies van der Rohe, Clive believes that detail is everything: even the ceilings have been given his magical touch, with fine craftsmanship evident in the structural steel joints. The large living area has four clearly designated zones for lounging, dining, cooking and working. Undoubtedly the heart of the house, the design and layout of the kitchen area is both seamless and sensible with utilities concealed but all within easy reach: the pantry is a walk-in cupboard, the fridge is behind doors and the island ‘hides’ the gas stove from the rest of the room. Clive made the kitchen island and cupboards, adding French detail with fleur-de-lis motifs – all brought into sharper focus by the natural light streaming in through the French doors and windows that overlook the water feature in the back courtyard. The gas stove slots neatly into the kitchen island, concealed from view by those in the lounge area. The island allows for easy chatting and entertaining while cooking, allowing visitors a fine view of, and easy access to, the back garden. The small hanging lights were originally candleholders from Mr Price Home. Light floods in through the many windows; the kitchen units are cast in cement and the wooden doors finished in attractive fleur-de-lis motifs. To keep the open-plan living area uncluttered, Clive designed and installed a wooden ‘cupboard’ that cleverly conceals the fridge – to the right is the walk-in pantry. In the living area, fine furnishings and design detail grab the eye: the fireplace surround is another of Clive’s designs and tactile, textured objects carefully collected over the years add the finishing touches. These include the ostrich eggs, Nguni hide and horns that Clive had painted white. "I love the tension the textures of the reed ceiling, the horns as wall sculptures, Nguni hide and bricks of the fireplace create in the otherwise all-white space," he notes. 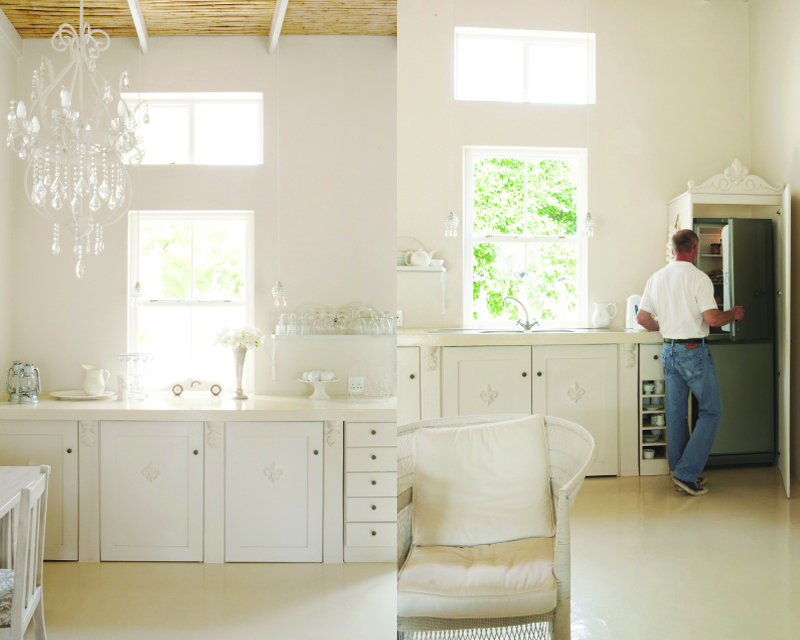 Ever the handyman, Clive made this sturdy table and armoire himself – as well as each one of the chandeliers, for which he imported 180kg lead-free crystals, painstakingly adding each one to the sparkling light fittings that lend a dramatic edge to the space. Impressive in its simplicity, the fireplace with fallow deer head anchors the room. Clive used Plascon’s Worn Wood (Code Neu 8) throughout the house – even on the floated, seamless cement floor, which was varnished with Plascon’s Pure Coat. "I used the same varnish for the counters, giving them four to five coats instead of two, for a durable yet shiny look," he says. BE BRAVE If this is the look you really desire, do not let anything or anybody distract you. 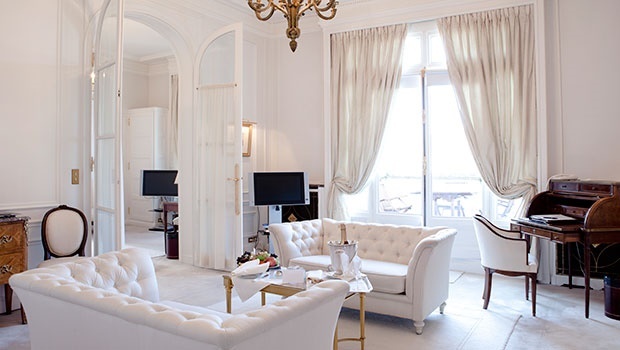 An all-white interior is not sterile – remember there are many, many shades of white which constantly change with the light, resulting in a shape- and texture-enhancing environment that is incredibly peaceful. VISUALISE your end result and stick to your plan. From the laying of the first bricks, I had a very clear picture of how I wanted my house to look and it has turned out exactly as I wanted it to. DO NOT COMPROMISE: To make it work requires a certain harmony and balance. TRUST YOUR INSTINCTS: Your home is your haven, so let it be as individualistic as you are. HAVE FUN: Working with a limited palette is a creative process that, whilst challenging, will be incredibly rewarding in the end. The main ensuite (left) offers plenty of space to bath and shower in comfort. It must be the bench on the stoep. In the mornings I love to enjoy a cup of coffee, watching the sun rise over the beautiful mountains. The majesty of nature... Paris... Wide open spaces. Any tips for would-be renovators? Look past the obvious, visualise the possibilities, trust your instincts and just do it! Your garden... do you have green fingers? I wish I had time for gardening but I’ve too many ideas in my head, too many new things to design and make. I really want to assist people to transform their homes into beautiful, stylish, inspirational, comfortable and peaceful living spaces. If you go about it cleverly, it needn’t cost a fortune. So I’d like to build more houses and expand my range of bespoke furniture. • Legend has it that the fleur-de-lis symbol (literally, flower of the lily), depicting a stylised lily or lotus flower, was used to represent French royalty and signified perfection, light and life. • The difference between Victorian broekie lace and that of the Karoo is that the former is made of iron, while the latter is pure woodwork.